I love the spooky month of October. Shadows creep across the path as days grow short. The groan of wind through desiccating leaves sends a death rattle from above. It swoops down and slides its skeletal fingers along my backbone. I pull my sweater tight. We met on Main Street and our group sauntered over to The Dredge. This mammoth piece of equipment dug muck and silt from the Blue River in hopes of discovering gold until 1942. Part of it was dismantled and melted down for WWII. What remained, sunk into the murky depths. A reproduction was built in its place and a restaurant has operated from its floating hull since 1995. It appears to be haunted by the men who died at this site. With my digital SLR, I recorded our guide, Gail, as she recounted stories of the discovery of gold. In 1859, they could walk through the river and pick up the sparkling nuggets with their bare hands. Breckenridge boomed. She explained that most miners lost 98% of their money to beer, women and gambling. There were two red light districts in this mountain community. I noticed the memory card was full on my camera, so I deleted some unwanted images. I took a few photos of the tour. When I viewed them, only four photos appeared. I freaked. There must have been over 2000 photos on this card including the shots I took in Europe and our recent trip to Wisconsin. How could I have deleted all of them? The four photos were so random. One had been taken in Hidcote Gardens in the Cotswolds, two from the Boulder floods and the fourth was a sunset. I clicked through them over and over in disbelief. I had backed them up on my computer, so I calmed myself. I missed most of the story about the unfortunate men who fell into the dredge’s sharp machinery. We left The Dredge and walked back down Main Street. I took a few more pictures and then viewed them. All of my photos reappeared. What? I felt those skeletal fingers playing my spine like piano keys. I figured there had to be a logical explanation. My old camera had a tiny built-in memory. I was sure that the SD card hadn’t been slipped in tight enough. We traveled down the street and heard a few more ghostly tales. One really struck me since I remembered the event. The pioneers struggled to live in those early years and were often buried in the ground right where they died. 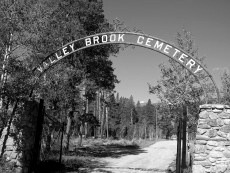 As the town grew, the Valley Brook Cemetery was built on the north end of town. Many bodies were relocated to their new resting place. It isn’t unusual to find bones when excavating for a new building in Breckenridge. In 1997, the bones of baby Eberlein were unearthed. Knowing her brother and mother had been buried in the cemetery more than a century earlier, a group of women decided to have a proper funeral for the baby. Townspeople came out in Victorian dress and had a procession to the graveyard. The baby was reunited with her family. Five days later was Halloween. A huge microburst struck the graveyard and tossed the granite gravestones like kindling. It destroyed a Victorian iron fence and an above ground crypt as it traveled south. It paused at the new Eberlein grave and then turned east. Although it missed the town, it blew down hundreds of lodgepole pines. We lost a few trees on our own property. That story gave me chills. We toured the Brown Hotel as our last stop. 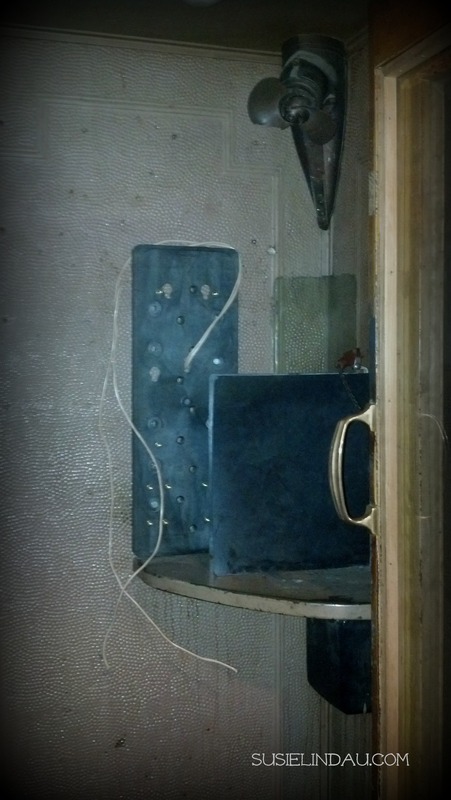 Its red wallpaper, dim lighting and dilapidated décor was right out of the set of Twin Peaks. 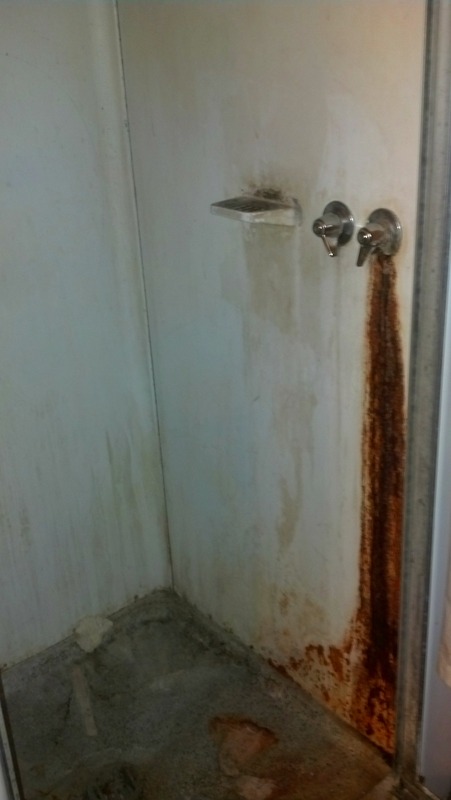 It had that deteriorating smell of rotting wool carpet and old cleaning fluid. We met the owner, Michael Cavanaugh, who now lives upstairs previously occupied by guests. The hotel is haunted by the ghost of Miss Whitney. In the late 1800’s, she wooed Captain Ryan with the intention of using the house for prostitution. He shot her while in bed. Cavanaugh tells a story about how his ex-wife fell asleep in an upstairs bedroom after touring the new purchase. She woke up to the door opening and slamming shut three times. After running down the steps through a gray mass, she ran through the snow with bare feet all the way to the police station where she demanded a ride home. He doesn’t believe in ghosts. Bartenders, who work from 8:00 PM until the wee hours every night, tell all kinds of stories. Doors open and shut. Faucets turn on by themselves. A woman in red has been spotted. These were very similar to the antics played by other ghosts in the area. Gail finished up our tour and I pulled out the memory card expecting to see those four photos. The error message, no memory card inserted, appeared. I told my husband Danny about the thousands of photos disappearing, my viewfinder only showing four, and then all of them reappearing after leaving the Dredge. “It wasn’t a loose memory card,” I said. Gail overheard me and said, “Ghosts are known to mess with people’s cameras.” I pulled my sweater a little tighter. I just checked to see if my camera has a favorites button, but the four photos are not marked any differently than the rest. Creepy or what? Dare I return to The Dredge to take more pictures? To read more about creepy events surrounding the microburst at the Valley Brook Cemetery click HERE. More about the Brown Hotel and its ghost. Shoot. Now you have me wishing I’d taken the haunted ghost tour in Savannah instead of the Historic District one. Very cool! 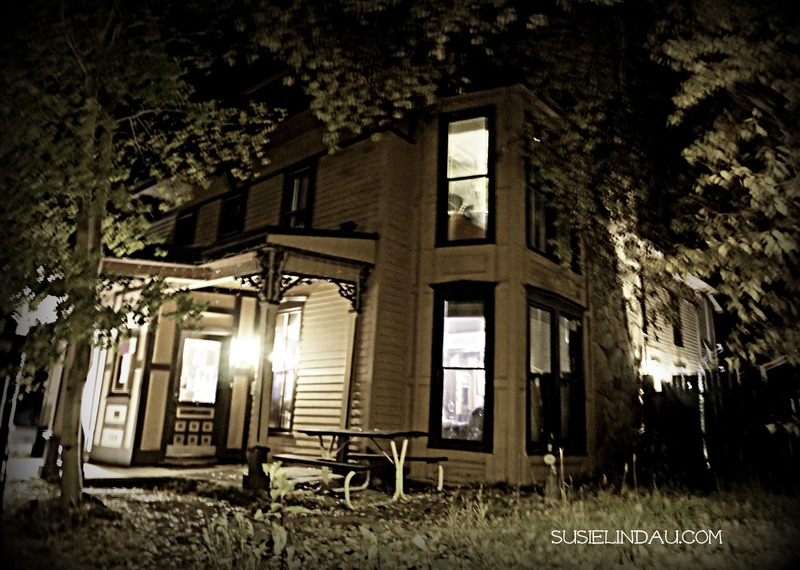 it’s been a while since I did a haunted house tour… you make me want to get out and experience one… almost. Halloween and All Saint’s day is coming. take care! It’s countdown time… I love this time of year. The cool thing about haunted tours is they give such great historical overviews of the town. They end up being very educational! Wooooo spoooky. Haunted tours may be offered year round, but always better near Halloween. Galveston was destroyed during the 1900 Hurricane – several of the old structures like the Galvez Hotel and the Bishop’s Palace have ghosts from different era. Very strange about the pix – any odd shadows are shapes in the returned pictures? I will have to check for fingerprints….It is that time of year when it is fun to get creeped out! 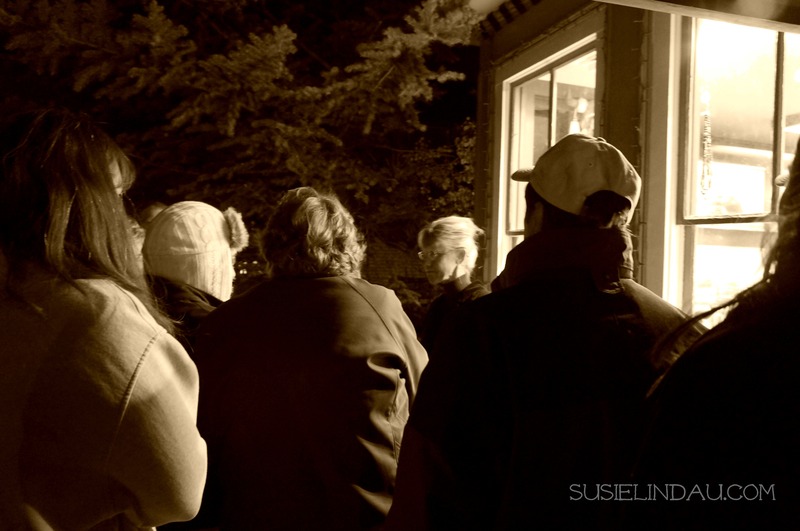 Love doing these haunted tours! Halloween is one of my favorite holidays. Spooky and creepy stuff going on with your camera. Also, I used to be a bartender and I don’t think I would have lasted long working there! I’m glad you did too! I love this time of year….Thank you!